If last week’s standing-room only turnout for the city’s regular Planning Commission meeting is any indication, the people of Stockton (albeit a specific set of people, more on that later) want a say in how their city grows. 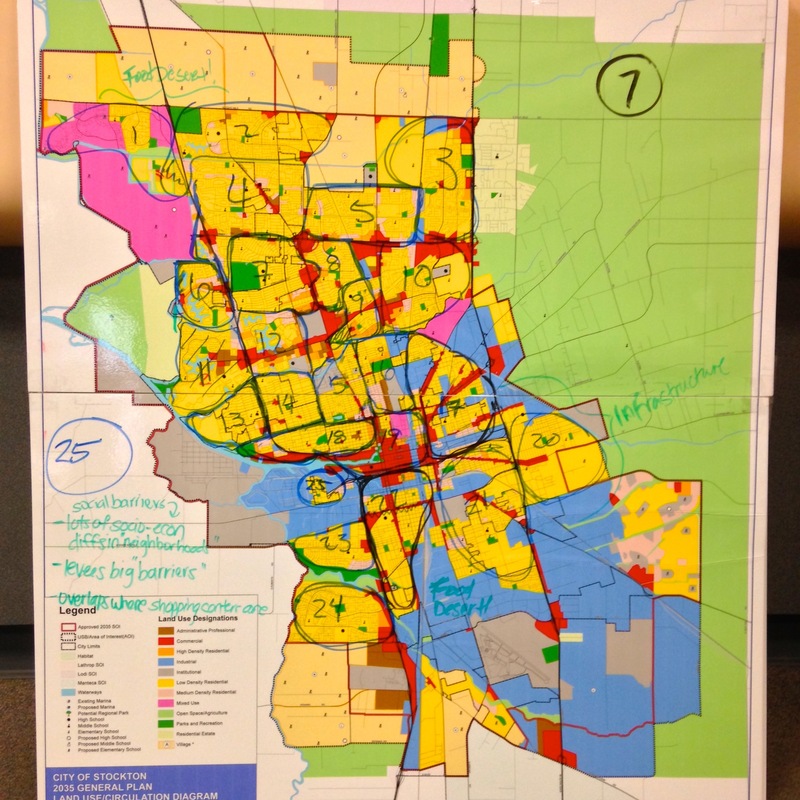 The regularly scheduled meeting was the venue for the first of several general plan amendment workshops where city staff are seeking public input on updating the city’s main – though now largely irrelevant – 2007 General Plan. Last Thursday’s meeting focused on neighborhoods. What defines a neighborhood? Is it shared services? Shared demographics? Are physical boundaries important? What about, as one commenter noted, invisible boundaries? City of Stockton Planning Director Forrest Ebbs led the evening’s discussion, directing those in attendance to break out into smaller groups, station themselves at one of the many propped up maps of the city and pick out eight to ten Stockton neighborhoods. The official designations, made at a later date after considering more community input, will be used to develop more specific neighborhood plans that will guide and develop local character on a smaller neighborhood scale. Picking out just eight to ten neighborhoods proved a challenge. Sentiment throughout the room suggested that for many, neighborhoods are reflected more by the people who make up the particular community rather than the services they geographically should share. Most groups far exceeded the specified range, instead breaking out the city into twelve, sixteen and even 25 different neighborhoods. Particular focus was put on the communities lumped into South Stockton and the barrier presented by the crosstown freeway – both literally and figuratively. “South Stockton is isolated, neglected, lost,” was one comment. “South Stockton represents a real social justice issue for this community,” was another. The comments were made by those who are not current South Stockton residents. So, South Stockton residents weren’t necessarily directly represented at this meeting and neither was another important demographic – youth, at least not at the scale proportionate to the size of this demographic within the city’s population. Despite the large turnout, only a sprinkling of attendees were younger than 40– admittedly better than many other public meetings — falling short of the mass Economic Development Director Steve Chase had called for previously. Getting input from younger city residents is important, not just because this plan will mainly affect them, but also because as cities grow, perspectives change and the 20 and 30-somethings living today in Stockton are increasingly blurring traditional neighborhood lines. Many converge downtown, seeking cheap and gritty space to work and express themselves. This demographic is increasingly travelling by different modes, meaning that barriers previously centered on the personal car aren’t necessarily applicable in the same way to someone who gets around by walking, biking or the bus. This is the input city staff need in order to develop a better, more competent document that accurately plans for the future. And it is hard. It’s hard to get people to come out on a weeknight. It’s hard to get people to stay engaged and listen to topics like “general plan elements” or “circulation” or “housing assessments.” It’s hard to do outreach to underrepresented communities when you don’t have the manpower available – but it’s necessary. Planning for the future of the city is a difficult, messy and oftentimes emotional struggle to balance collective needs with the wants of the individual. It’s almost as democratic as the process gets and if we, as residents of Stockton, want to have an effective, balanced and progressive planning document to guide our growth then we need to find a way to get everyone, dry-erase markers in hand, down to city hall to make their mark, to voice their thoughts and to create a communal document reflective of everyone who lives within Stockton. The exercise conducted at the neighborhood workshop is still available to anyone who’d like to participate by visiting the city’s Permit Center at 345 N. El Dorado Street or by calling (209) 937-8444. The next scheduled public general plan workshop is slated for 6 p.m. Thursday, August 28, in the city council chambers. People’s mindsets are skewed and negating. People always and typically perceive the Cross-Town Freeway as a formidable ‘barrier’ that divides South Stockton from the rest of the city, instead of seeing it as a positive element, a “GATEWAY” to South Stockton. And yet it is odd that people do not perceive the freeway ‘barrier’ negatively in a reverse perception and fashion that divides Downtown Stockton away from South Stockton. So this clearly reveals how people’s mindsets need to be jogged into a free thinking new reality. And part of the problem is there is nothing in South Stockton to attract visitors and activity. There is no reason for people to want to go there. So what do you do? Yes, you create DESTINATION. There is so much incredible transformation that can be done to re-conceptualize South Stockton, but there is a lack of vision and funding. An ambitious redevelopment program really needs to be conceived and hatched to reclaim this area with vibrancy and renewal, and as a significant destination for all Stocktonians to share and be prideful. And I’m not just speaking of mere ordinary housing issues. There needs to be the integration of major flagships and cornerstones that gravitate and engage activities and transactions. It has always puzzled me why there isn’t a “Jeremiah B. Sanderson University” in South Stockton as a major cornerstone of higher education for the Black community that would leverage the significant identity and integrity of this great Stocktonian historical figure, an educated Black man schooled by Captain Weber, Stockton’s founder. Such a cornerstone could be complimented with a University Village and adjacent Sanderson Cultural Center, perhaps botanical gardens or arboretum. The contaminated Mormon Slough vicinity needs to be cleaned up and the whole area rezoned and de-industrialized. This district would make an incredible community urban park bordered with high density housing and retail village with strolling walk and bike paths along the embarcadero waterway. People really need to start thinking outside of the box and the confines of mundane limitations.